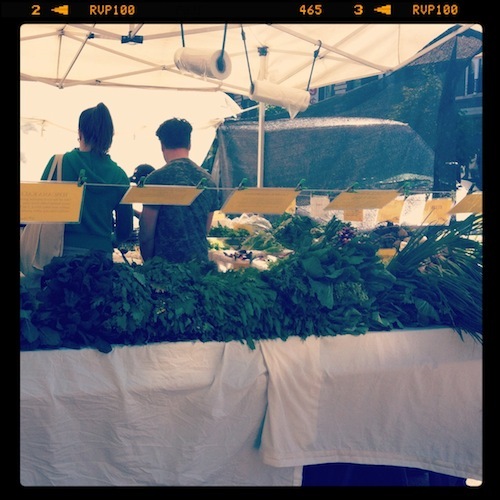 Two weeks ago, when I showed up at my farmers’ market after an absence of a few weeks, I was met with an avalanche of greens. After a long winter of earth-toned root vegetables, it was all I could do to restrain myself from taking all of those leafy, perky greens home. I bought more than I could reasonably carry, and spent the week cooking them all up. Unlike root vegetables, which docilely await their fate in my large wooden bowl, sometimes for weeks on end, spring greens have a particular urgency to them. I could hear their call from where they were stashed away in the fridge, and a flurry of spring meals followed: a super easy asparagus-parmesan bake, wild baby spinach(!) pancakes(!!) with cilantro-lime butter(! ), a wheat berry salad straddling the seasons with winter citrus and a tumble of arugula, and a gorgeous egg skillet with ramps and chard. Clearly, we have a lot of catching up to do. Let’s start at the beginning. 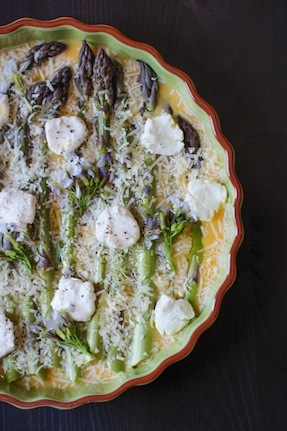 I put together this Easy Asparagus-Parmesan Bake while the rest of my loot was still in my (cloth) bags. 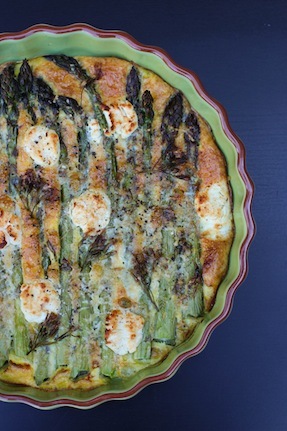 I guess it most closely resembles a frittata, but that somehow makes it sound frillier than it is, when all it entails is tightly lining up your asparagus in a baking dish, pouring over a few lightly beaten eggs, dotting it with goat cheese, a sprinkling of parmesan, salt and pepper, and a little gloss of olive oil, and your work here is done. Fifteen minutes later, you have yourself a light, satisfying, and pretty spring meal. These types of recipes- that are not much of a recipe, really- might just be my favorite. They seep into my sensory memory, making themselves comfortable in a little corner, ready to pop out at the slightest prompt. Now, when I see a bunch of asparagus, my mind reaches for this dish. 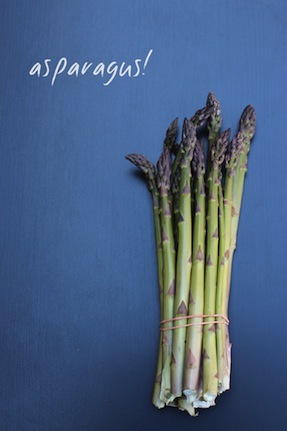 Begin with a bunch of fresh asparagus. 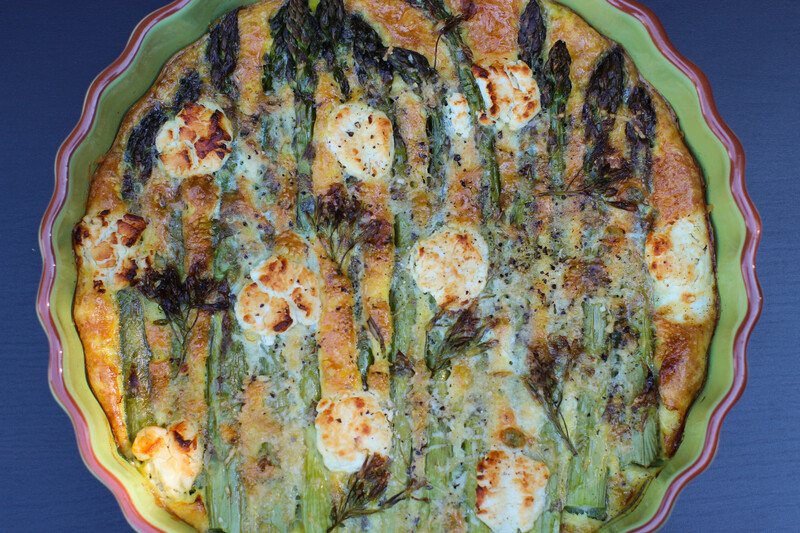 Preheat your oven to 350F, and choose a baking dish large enough to accomodate the asparagus or your appetite. Wash the asparagus, dry them, and snap off their woody ends. Drizzle a bit of olive oil into your baking dish, and swirl it around until it is lightly coated. 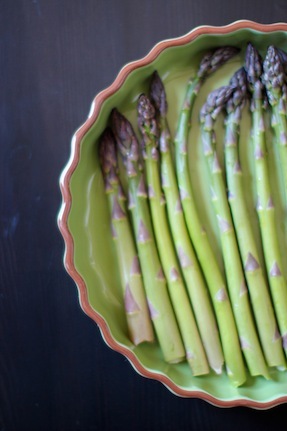 Line the asparagus snugly into your dish. If you have some fresh herbs on hand, such as chives, thyme or parsley, scatter them over the top of the asparagus. In a small bowl, lightly beat a few eggs with a fork, and pour over the asparagus, until they reach 2/3 of the sides of the stalks, but refrain from “swamping” them, to borrow Margaret Roach’s term (start with two eggs, and add another egg or two if needed, depending on the size of your dish). Dot with pieces of soft goat cheese, and a generous sprinkling of parmesan. Season with salt and pepper, and a final, gentle drizzle of olive oil. Bake until almost set (about 15 minutes), and finish briefly under the broiler until golden (just a minute or two). To serve, cut between the spears, lifting out long, elegant slices. Our markets, even at the lake haven’t begun.. I can’t wait to try this with freshly grown asparagus! YUM!!!! 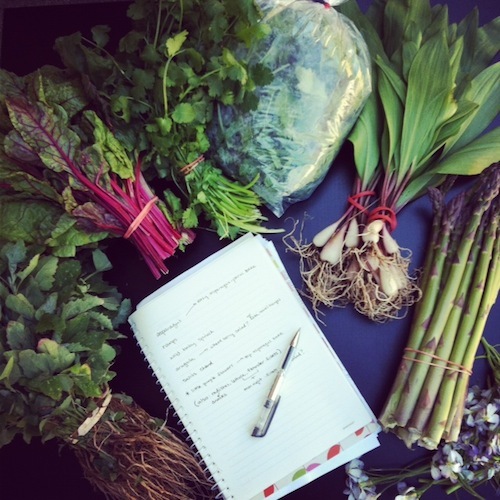 Just bought asparagus and goat cheese from the farmer’s market and couldn’t figure out what to do with it….can’t wait to make this!!!!! Asparagus is very helpful for health and weight loss i always give it to my family. thanks for this posting so that we can make something differently.